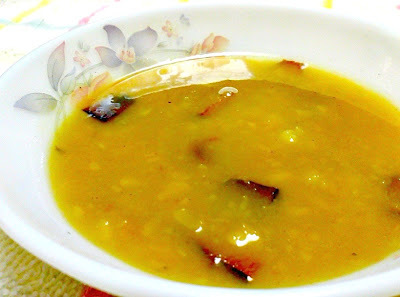 Payasam (Porridge) is a staple on festival days, in South India. Though Chakkarai Pongal is the queen of the festive spread, my mom's paruppu payasam has been quite popular. A protien rich dessert, this dish is quite easy to make with only 3 main ingredients. cardmamom powder - 1 tsp ( 2 pods powdered with a little sugar for traction). Pressure cook mung beans in just enough water to cover the beans. You can cook the beans in milk, if preferred. Reserve a tablespoon of cooked beans and thoroughly mash the rest. In a small saucepan, melt jaggery on low heat, in just enough water to cover it. Stir continuously and poke the cubes occasionally ot help it disintegrate quickly. Remove from heat and strain away impurities, if any. In another saucepan, heat ghee. Before it starts to smoke, fry thinly sliced coconut pieces. When the coconut turns golden brown, strain and remove. In the same saucepan, add both the mashed and reserved beans an melted jaggery to it and bring to a light boil. Add a pinch of salt to enhance the sweetness of the dish. Stir continuously until everything is blended well. this will take around 10 minutes. Add enough coconut milk to bring the dish to the right consistency (think of a bisque). Add the fried coconut pieces, and remove from fire. Sprinkle cardamom powder and stir.